As part of its mission statement, Medtronic is dedicated to contributing to human welfare by applications of biomedical engineering in their research, design, manufacture, and sale of instruments or appliances that alleviate pain, restore health, and extend life. It is a $6.5 billion company with 27,000 employees worldwide and is a world leader in medical technology. The company has 250 locations in America, Europe, the Middle East, Africa, and Asia. The company is based in Minneapolis, Minnesota and has been honored by Fortune magazine within the last two years both making the annual list of the hundred best companies to work for and is ranked number one in its industry of America's most admired companies. The company makes medical products and technologies for cardiac rhythm management, diverse types of surgery to include neurological, spinal, and ENT, vascular therapy and diabetes therapy. LaDrene Coyne, Senior Diversity Consultant at Medtronic Physio Control Aimee Nelson, Employment Specialist for Trillium Employment Services (supported employment services). Ms. Coyne described the current efforts of Medtronic in the inclusion of individuals with developmental and other disabilities. Dr.Larry Rhodes of the University of Oregon and Trillium Employment Services made initial inroads at the Medtronic Physio Control site for those with developmental disabilities in 1983 forming a collaborative partnership. In working with Trillium, Dr. Rhodes established the first enclave for eight individuals with development disabilities in electronic assembly. Two decades later these individuals have been mainstreamed in the company in four types of manufacturing production activities, mailroom, packaging, and shipping. Since then the company continues to hire individuals with developmental and other disabilities through temp agencies while others continued to be hired through Trillium. Supported by State Developmental Disabilities, Trillium continues to provide ongoing employment support to the individuals in Supported Employment, but most of the training today is provided through natural supports. Ms. Coyne's goal is to bring other Medtronic divisions on board with supported employment and hiring people with disabilities. She now serves the company as their diversity consultant and has been working with Medtronic facilities in the Minneapolis area in implementing Supported Employment Programs. Two facilities have recently hired five individuals with developmental disabilities while two other facilities will soon be implementing the program. The jobs range from assembly, mailroom, janitorial, copy centers, to shipping and packaging. Ms. Coyne's goal is to bring two to three divisions each year into the supported employment program. She firmly believes that "diversity needs to be driven from the top down with strong lateral connections to Human Resources". She believes that her company is truly committed to an inclusive workforce. In addition to individuals with developmental disabilities, the company has reached out to other groups with disabilities and has made accommodations to support their productivity. What began as "an enclave" is now truly "individualized employment" for those with disabilities and this perspective is steadily being seen throughout the company. As Brian Webster, Vice President of Manufacturing has noted, "We no longer think of it as a supported employment program here at Medtronic, Physio Control. These team members in Supported Employment are woven into the fabric of Medtronic Physio-Control's culture. In many ways, they are more core to the culture than average team members." The company prides itself on the fact that none of these positions was specifically "created" for individuals with disabilities, if these individuals weren't doing these jobs someone else would be. Medtronic, Physio Control has "blazed a trail" for supported employment throughout the country with numerous celebrities visiting the company including Eunice Kennedy Shriver, William Bennett, former US Secretary of Education, etc. Ms. Coyne and Physio Control managers have spoken at seminars across the country and testified before the US Senate Ways and Means Committee on the merits of supported employment. Additionally, the company has been very supportive of the Business Leadership Network (BLN) particularly in the state of Washington. In addition to financial sponsorship of the Washington State BLN (WSBLN), Medtronic Physio-Control actually provides office space and physically houses the WSBLN in its Redmond, Washington headquarters. Medtronic Physio-Control is the lead company for the WSBLN. Ms. Coyne has been a loan executive to the WSBLN in its forming a 501(c)3 and other activities. The company truly is a pioneer in advancing supported employment and now the use of natural supports in hiring individuals with developmental disabilities. In addition to presentations at various business and rehabilitation seminars nationally, Ms. Coyne, Trillium representatives, and other personnel provided a symposium keynote at the Association for Persons In Supported Employment's annual conference last year. The company is to be congratulated for supporting Ms. Coyne in her creative outreach efforts company wide. In 2001, she was one of seven people acknowledged by the company with its customer focus award, the Star of Excellence. She is truly a standout in her role as a bridge between the rehabilitation and business communities and it is noteworthy that she has been able to develop her program with direct line to administration in collaboration with Human Resources. The company is truly to be commended for its inclusion efforts in transitioning qualified individuals with diverse disabilities into its workforce. There is an emphasis on reflecting the company's customer base and the societal makeup in its workforce personnel. 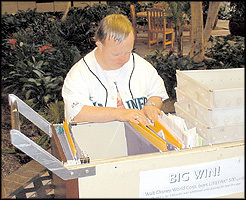 Commitment to employment outreach activity for individuals with disabilities external to the company is exemplary. It is truly a minority of companies that financially sponsor the Business Leadership Network (BLN), but in this case Medtronic actually provides office space, logistical support, and part time use of Ms. Coyne as a loan executive. Ms. Coyne has been instrumental in developing the Washington State Business Leadership Network's 501(c)3 structure and many other operational issues. McMahon, B., Wehman, P., Brooke, V., Habeck, R., Green, H., and Fraser, R. (2004). Business, Disability and Employment: Corporate Models of Success. A Collection of Successful Approaches Reported from 20 Employers. Richmond: Virginia Commonwealth University, Rehabilitation Research and Training Center on Workplace Supports and Job Retention.